Content marketing fails because most people don’t understand visitor intent. I’m talking about matching the right content to the right visitor at the right time. What you cannot do is mix and match the expected results with the content of your choosing. Your expected results must match the visitor intent for the type of content they are consuming. Note the blog alone is responsible for 9 percent of their entire Google search presence, and contributes 9 percent of all clicks to the site. These visitors are all tippy-top of funnel at this stage, and should not be expected to be driving macro conversions. As expected, the blog only generates 1.6 percent of all macro conversions, converting at roughly one-fifth the rate of the rest of the site. Is this bad? No, the blog is doing exactly what it was designed to do. Over the past three months it funneled 1.4k clicks and 39.5k impressions into the top of the funnel. It created a presence that otherwise did not exist. These visitors afford an opportunity to grow your newsletter subscription list (by 500 percent if you use a pop-up) so that you can nurture these visitors into the middle of the funnel. The question now becomes: How do you get them from the top of the funnel to the middle? Referring back to our chart above, we see that middle-of-funnel visitors are interested in consuming ebooks and white papers. They are exploring at this stage; both the topic of your downloadable asset and your aptitude for reporting on the subject matter. For the same healthcare client, Brafton created both an eBook and a conversion landing page to download it. The client then sent out a newsletter to their subscribers (top of funnel) with a CTA linking to the landing page. We also supported by advertising the asset on the client’s social networks. From August 1, 2016 to April 19, 2017 their conversion landing page received 582 unique pageviews, with 202 eBook downloads. This means the landing page had a 35 percent conversion rate, contributing 202 conversions. This is 202 unique prospects moved to the middle of the funnel. Now you have their attention, but you have to stay top of mind. You want your prospects to remember you! Once your prospects have downloaded your eBook, you’ll want to nurture them with content relevant to their next stage in the funnel. Referring back to our chart, we see that you should be providing case studies, success stories and testimonial content. Send these as a follow-up email drip after the prospects have downloaded the asset. Going back to our client, we see that, using a First Interaction Model, organic search contributes 69 percent of all macro conversions (request for demo, etc.). This means if we were to give full credit to the first source a visitor came from, 69 percent of it would go to organic traffic. But this doesn’t tell the whole story, does it? Following our formula above, it should hold true that most visitors don’t really contribute a macro conversion until they have gained familiarity with the brand by moving through each stage of the content funnel. If we did our job correctly, they will have remembered our brand, then return when they are ready to make a conversion. If this is accurate, we should see the last interaction before a conversion coming from direct traffic. Our blog contributed very little in the way of commercial-related transactions. What it actually did was broaden the top of the funnel and usher in traffic that wouldn’t otherwise find our client’s web property. From that point, some of these visitors subscribed to a newsletter. Those subscribers were shown a CTA of an eBook we created for a client, which led them to a conversion landing page. 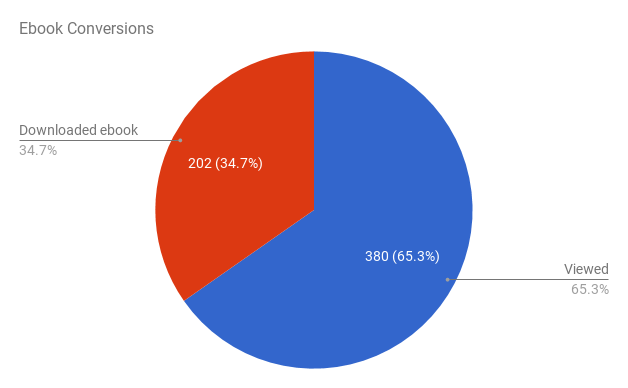 Thirty-five percent of those visitors submitted contact information and received the eBook. We then determined our mid-funnel traffic converts once it becomes familiar with the brand; 49 percent of all conversions come from direct traffic, most of it occurring after discovering the site via organic traffic. To complete the cycle, these visitors submit a request for a demo. 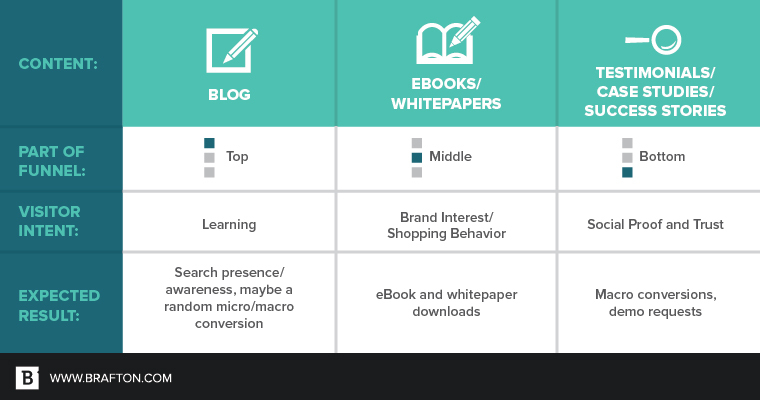 This is the full cycle of how content marketing works at each stage, and what to expect from each type of asset. Remember, always match your content expectations with the intent of the visitor consuming the content.